A nice glass of Chianti…a cold beer on a hot summer day…celebrating with a flute of champagne. There are so many ways that alcohol is integrated into both everyday life and special occasions. Granted, not everyone drinks alcohol, but many people do. And when it comes to the question, "Can I drink alcohol if I have diabetes?" the answer is about as clear as that for "Is a low-carb diet good for diabetes?" In other words, the answer really is, "It depends!" It’s important to mention right off the bat that there are certainly many reasons why people should not drink alcohol. Some may be related to diabetes and some may be related to other reasons. Therefore, it’s important to discuss this issue with your health-care provider if you have any doubts or concerns. And if you’re newly diagnosed with diabetes or starting on a new medicine, it’s worthwhile bringing up the topic if your provider doesn’t. 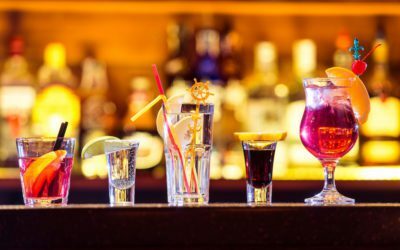 While you’d be hard-pressed to find any health organization actually recommending that you drink alcohol, you might take some comfort in knowing that the American Diabetes Association, the American Heart Association, and even the American Cancer Society agree that drinking alcohol in moderation is certainly not off-limits to most people. But back to diabetes and alcohol. What’s the concern here? And why should some people with diabetes not drink alcohol? To answer these questions, it’s helpful to understand a little bit about how alcohol is processed in the body. The body treats alcohol as a drug, not as a food product. This means that, when you drink any type of alcoholic beverage, your liver kicks into high gear, preparing itself to “detoxify” the body of this “poison” (I’m using these words for dramatic effect). Essentially, the liver has to metabolize, or break down, alcohol into less harmful substances. This takes, on average, about two hours. While the liver is truly a miracle organ, it can only do so much multitasking at one time. And handling alcohol is its number one priority. So, this means that while your liver is busy reigning in the effects of that green apple martini, it may not pick up on the fact that your blood glucose levels are starting to wind their way down. In most cases, your liver is able to release glucose when blood glucose levels start to drop in an effort to prevent low blood glucose (hypoglycemia). But with alcohol on board, this may not happen. Now, it’s no big deal if you have diabetes and you control your blood glucose with a healthy eating plan and physical activity alone. Hypoglycemia isn’t going to occur if you don’t take medicine. However, if you take certain types of diabetes pill, including sulfonylureas (tolbutamide [brand name Orinase], tolazamide [Tolinase], chlorpropamide [Diabinese], glimepiride [Amaryl], glipizide [Glucotrol and Glucotrol XL], and glyburide [Diabeta, Micronase, and Glynase]), meglitinides (repaglinide [Prandin] and nateglinide [Starlix]), or insulin, your chances of developing low blood glucose rise considerably. Your chances are even higher if you’ve been drinking on an empty stomach (think cocktails before supper); if you grab a beer or wine cooler after a few runs down the ski slopes (exercise is already lowering your blood glucose levels); or if your blood glucose levels are already on their way down (too much medicine and/or not enough food). The question was actually a good one (although we’d never recommend using alcohol in that way). But what he didn’t realize, at the time, is that alcohol is not always so predictable. Some people metabolize alcohol more slowly than others. And alcohol metabolism can depend on factors such as the amount of alcohol consumed and over what time period; body size; type and amount of food eaten along with alcohol; and level of physical activity. It’s therefore not unusual to hear stories from people (often college students) who, after having had a bit too much to drink, “went low” in the middle of the night or even the next morning after a night of partying. Well, out of time and space for this week. We’ll continue our in-depth look at alcohol and diabetes next week. Cheers!